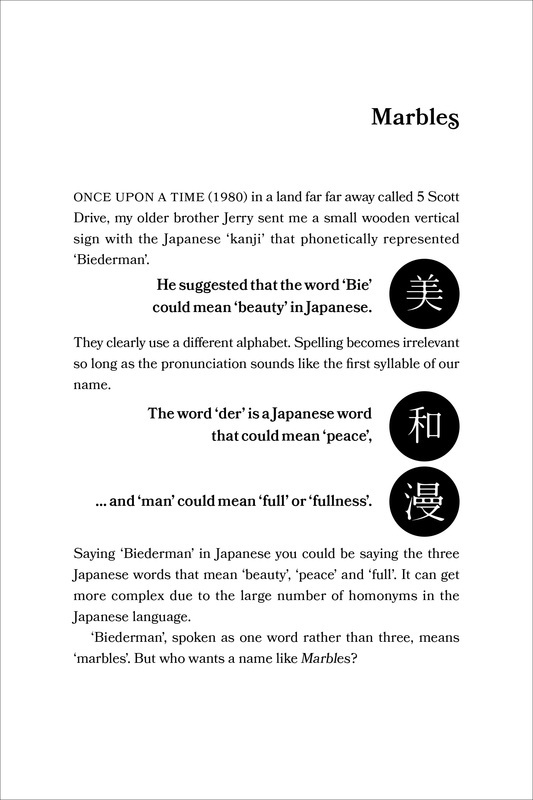 Order Your Copy of "Marbles"
.......... the singular memoir by Robert Biederman, is a collection of 21 unforgettable and extravagantly diverse personal experiences. Biederman examines life at inception, at death, and the many moral choices in between. 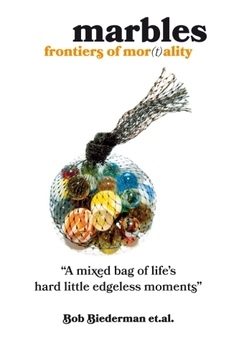 His bag of Marbles focus on family relationships, their evolution and devolution as well as a few comic moments that reflect some of the absurdity in our judgment. What results is an uncompromising look at life’s hardest moments, narrated with warmth and humility. • A recovering alcoholic, enduring the memory of his own father’s suicide, comes home to the news of his own son’s death from self-inflicted gunshot wounds. Wounds that resulted from guns the father had hidden under his bed. What is a TIP Volunteer and how does he help the father survive those first 12 hours? • The land of Israel as seen through the eyes of a sabra with memories of every war fought. It’s a vivid telling of her participation and her current life below the Golan amongst her Arab neighbors. The situation in the Middle East presents a paradox; the endless cycle of violence provides an opportunity. • Where does your mind go when you kill another person? What do you do? What does the world really do? • Crohn’s Disease tests a family’s cohesiveness. • Teenage parenthood leads to a journey through Open Adoption and its unintended unpredictable consequences. • A brilliant neurologist transplanted to Australia from South Africa via Abbey Road is forced to face the broken promises of the Golden Years. He deals with the wonderful companionship of his adult children, the good fortunes of a life reborn in Sydney and the fleeing coherence of his wife of 50 years. Alone, surrounded by love and respect. • Are the overt actions of the Dominant abusive parent the proper focus of rehabilitation? Are the roles of Dominant/Submissive isolated to the bedroom, the schoolroom and Boardroom? Do they play out on the world stage, in your own personal toxic relationships? • Infidelity as a practice bears a strange resemblance to the Geneva Conventions. The consequences run parallel. Expediency defines political correctness. Today’s smiling truth trumps tomorrow’s sometimes easily avoidable consequences. Are sexuality and intimacy one and the same? Two primal needs bring conflict and opportunity for resolution is elusive. Do you bear the responsibility of the consequences of your actions? How often are those consequences escapable? Our lives are not solitary. Each of our experiences embrace another human being. We exist in pairs and small groups that define us and are called “family”. When the choices we make turn against us, family can deteriorate, pull together, or shatter into factions. Mending relationships, abandoning, or enduring them create the cast of characters that dictate future decisions and their consequences. What is truly right, truly moral, and what is just expedient? Do we race through life just a step ahead of the consequences or walk in comfortable cadence with those around us who share our values and forgive our lapses? Are those infrequent near-death experiences brief escape hatches from the actions we’ve taken, deeply regret, and live in fear of the pending consequences? Morality of the ‘70s viewed with a puckish twist. Driving the dark streets of Waltham, Massachusetts as a night shift cabbie puts you in front of boredom, drunks, drugs and death punctuated by a letter to a brother on the other side of the planet in Osaka. A father and 12-year-old son deal with their imminent mortality as their fishing boat sinks in a sudden storm; the choices they each make and the consequences. A young man faces the internal emotional conflict and consequences of taking a stranger’s life. End of life scenario reflecting on life choices made that echo through the generations unresolved and unresolvable. Indignant high-minded moral judgments we make, and then reverse based on the passage of time. The father/son relationship in the face of mortality, the burdens of the past and the consequences for the future. Is the behavior so widely embraced in “50 Shades of Grey” so unusual and relegated to the privacy of the bedroom? Does that same pattern exist throughout our personal lives and the global communities? What does inexorable mean, and does it apply? Harold Brown, once a member of the Forbes 400 survives Bankruptcy See a $635 million bankruptcy through the eyes of one of the country’s most successful real estate investors. He faced off against 33 banks and survived three years in bankruptcy Court while 30 of the banks did not. His current scorecard reads $1.4 billion. A father tries to explain the existence of heaven to his 12-year old son. The silent moral acts of a long gone generation in Natick, Massachusetts reverberate from the confines of a local hot dog stand throughout the town and its future. A short parable from Doug FlutieLand. A college senior faces the challenges of bigotry, peer pressure and the ‘right thing’ to do, or not, and why? The reality of day-to-day life in Israel bears no resemblance to the views expressed by the agendas of the politicians and media. The people’s life, as seen through the voice of a 60 year old female Sabra has a ring of truth and inescapable reality. A 75 year old South African Neurologist builds a new life in Sydney only to deal with his brilliant wife’s descent into Alzheimers and why he’s an “American Exceptionalist”. An homage to the Boston Red Sox and life itself.